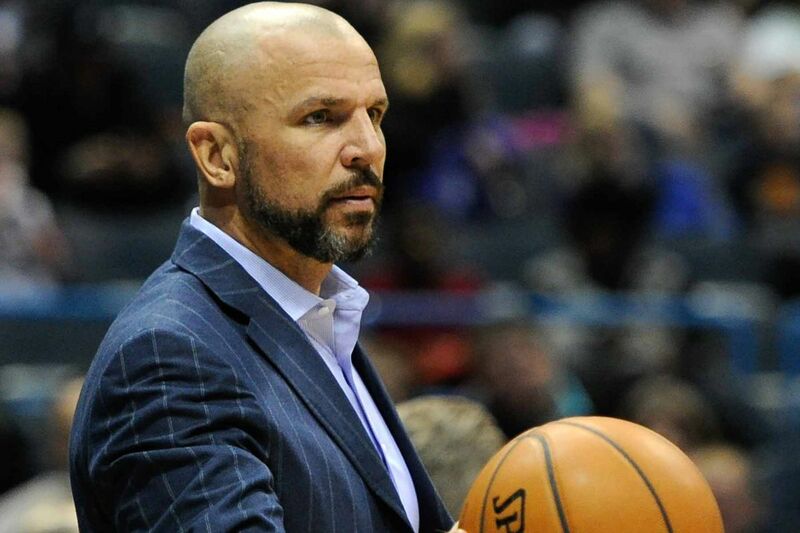 Jason Kidd Bio, Career Stats, Wife, Son, Parents, Net Worth, Crime, Why Was He Fired? Jason Kidd is a former basketball player who played in the National Basketball Association (NBA) for teams such as the Dallas Mavericks and New York Knicks. After his playing career, he took to coaching and most recently, he was the head of the Milwaukee Bucks of the NBA until he was fired in January 2018. Through his career as a player, he recorded a lot of successes which somehow, have not been able to show themselves in his stint as a coach, although he has still done pretty well. The former basketball star was born Jason Frederick Kidd on March 23, 1973, in San Francisco, California. He was raised by his parents, Anne Kidd – who was of Irish descent and Steve Kidd, an African American, alongside two sisters, Denise Kidd and Kim Kidd. He began playing the sport for which he will gain fame when he was still a kid growing up in Oakland, California. Interestingly, he did not even start with playing basketball when he was very little until he was in second grade. Before then, he played soccer. For his education, he went to St. Joseph Notre Dame from where he graduated. While there, he rose to become one of the best high school players in the United States, having a number of awards to show for his hard work. In 1992, he went to the University of California where he was again, an exceptional player, still the Golden Bears all-time assists leader. More so, his Number 5 jersey has been retired by the college. In 1994, he decided to enter for the NBA draft and was selected with the second overall pick by the Dallas Mavericks. Jason Kidd played for the Dallas Mavericks until 1996 when he was traded to the Phoenix Suns. He remained there until 2001 when he joined New Jersey Nets with which he played until 2008, and then, he was back to Dallas Mavericks in 2008. In 2012, he moved to New York Knicks but only played a season before he retired. Described as the first Lebron James, Kidd played 1391 games through his career years, taking home an average of 12.6 points, 6.3 total rebounds, and 8.7 assists. An Olympic winner with the American team in 2000 and 2008, he won the NBA championship in 2011, made 10 NBA-Stars, and many more achievements. His Number 5 jersey was also retired by the Brooklyn Nets. Coaching Career – Why Was He Fired? With that much of a rich resume as a player, there was an open door for him as soon as he retired to begin coaching, which he started with the Brooklyn Nets. As a rookie coach, he became the second to win the Eastern Conference Coach of the Month twice with the same team when he won it in January and March 2014. He was later secured by the Milwaukee Bucks. He turned the team around immediately, leading it to the playoffs, having recorded a bad run just the previous season. Although his success continued, considering that in the next three years, he would see the team to 2 playoffs, he was fired in 2018 after a 23–22 record. Apart from the record which was the main reason why he was fired, the management had also lost trust in him to lead the team to success. As pointed out, the parents of Jason Kidd are Steve Kidd and Anne Kidd, both of whom have been significant in his successful basketball career. In 1997, he got married to Joumana Kidd. Although the marriage produced a son, Trey Jason (T.J.), and twin daughters – Miah and Jazelle, it ended in a bitter divorce in 2007, amidst claims of extreme cruelty and much more. The next time he got married was in 2012 when he tied the knot with Porschla Coleman. With his second wife, Kidd has two children. In the early 1990s, he had an affair with Alexandria Brown which resulted in the birth of his first son, Jason Kidd Jr on Nov. 16, 1993. Brown had to sue the senior Kidd for a paternity test to make the star know that the kid was his and so he had to provide child support. Even though he is not someone who can be associated with crime, he has had his path crossed with the law more than once in the past. The first time he got involved with the law was in 1994 when he was slammed with a hit-and-run charge following an accident. Fast forward to 2001, he was arrested for domestic abuse against his then-wife, Joumana Kidd, a crime to which he pleaded guilty. In 2012, he was again arrested but this time around, it was for driving while intoxicated. For an individual who has reached his height of career accomplishment, Jason Kidd has a net worth that has been estimated at $73 million. Most of his fortune came thanks to his involvement in basketball.